When I left school to go to university I already knew I was going to work in finance. I had wealth of work experience in the City, so life on a trading floor seemed inevitable. True to form, straight out of Loughborough I got a role on a bank trading floor in Canary Wharf. Over the next few years I moved around, including to Australia and back, and moved from a credit trading background to the far more wholesome foreign exchange industry. I've always been heavily into my food (both eating and cooking) and I have to admit the client lunches during my time in finance were a nice perk. But, in a familiar Millennial-esque tale, whilst my career was financially beneficial, it wasn't 100% fulfilling. With my love for Thai food well known among friends and family, they helped to give me the confidence to offer myself and my food up to public scrutiny. One of the biggest backers in question at the time was Rich – then a mate, now my business partner, who jumped at the opportunity to be involved from day one. We started out with a guest spot at Druid St market one Saturday in April 2016. Two and a half years on, we both work for KraPow LDN full time. 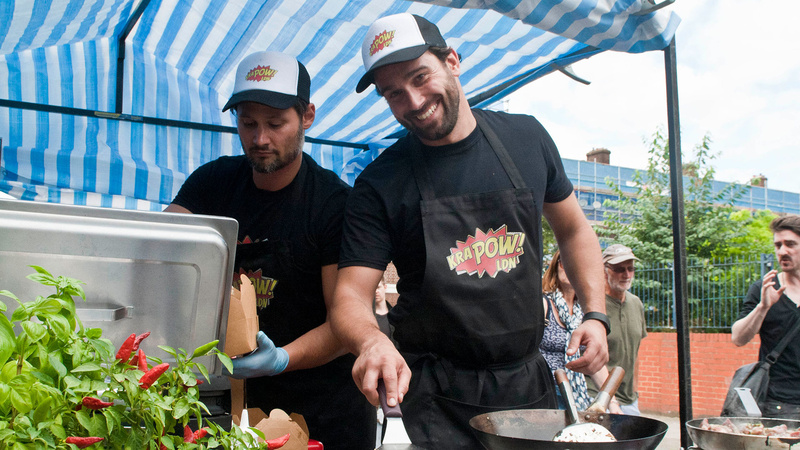 These days we've gone from street food stall to an award-winning pop-up in Hackney. We've scooped My London Dish (2017); cooked alongside Michelin star chefs at London Food Month; appeared on TV; and traded at some of the biggest festivals in the UK. It has been a crazy, wild ride. Sure, I miss the financial security and both Rich and I have made plenty of sacrifices along the way, but I'm forever glad I got that support from loved ones and we made that decision to switch keyboards for woks.